Diseases of Polynesians as seen in Queensland. Description : 59-63 p. [1 l.] pl. ; ill.: 1 phot. ; 25 cm. Subject : Fingers — Acroosteolysis (symptom). Author caption: By F. Bowe, M.B., Maryborough, Queensland. Appointed director, Polynesian Hospital, 1886. Cited: Cantlie, J. (1897) Report on the conditions under which leprosy occurs..etc, London: Sydenham, vol. clxii; p. 214. Photo caption: Necrosis Of Fingers And Toes (Dr. Bowe's Paper). 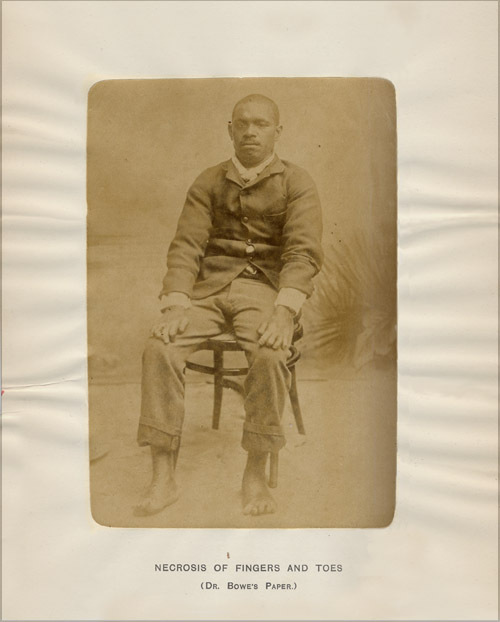 I should now like to draw your attention to the photographs of a Polynesian named Lambar, who is suffering from a disease which is new to me, and about whose cause and nature I have no idea. 919. Lambar, a native of Motlap, one of the Banks Group), about 24 or 25 years of age. Was healthy up to nearly two years ago, when the ends of his fingers became swollen, the skin broke, and pieces of the bone came out, and four months afterwards the same process commenced in his toes. He now has the appearance of having suffered from partial amputation of all his fingers and toes. The following is a description of the fingers in detail :—Left thumb is flexed at terminal joint, the last phalanx is shortened to half-size, and it is doubtful whether there is any bone ; it retains the nail. First finger.—The terminal phalanx has disappeared, and half of the rest. There is still a small piece of thickened and roughened nail. On the under surface there is a superficial ulcer, due to pressure from using a broom one day. Second finger.—No nail on this finger, and still less of the second phalanx. Third finger.—Small piece of nail, no terminal phalanx ; the second apparently entire. Fourth finger.—No nail, the greater portion of the second phalanx gone. Right thumb.—Small piece of thickened nail, terminal phalanx gone. First finger.—A shred of nail, terminal phalanx gone. Second finger.—The nail retained, smaller than natural, and thickened ; both terminal second phalanges gone. Third finger.—Nail is retained, terminal phalanx gone, the second shortened. Fourth finger.—Scale of nail, terminal phalanx gone, the second shortened. The condition of the feet is much the same. The boy appears to be perfectly healthy in every other respect, no loss of sensation. The only peculiarity about him is the extreme tenderness of the skin. If he does any kind of manual work, however light it may be, a large blister at once rises, which soon afterwards forms a superficial ulcer.— Page 63. 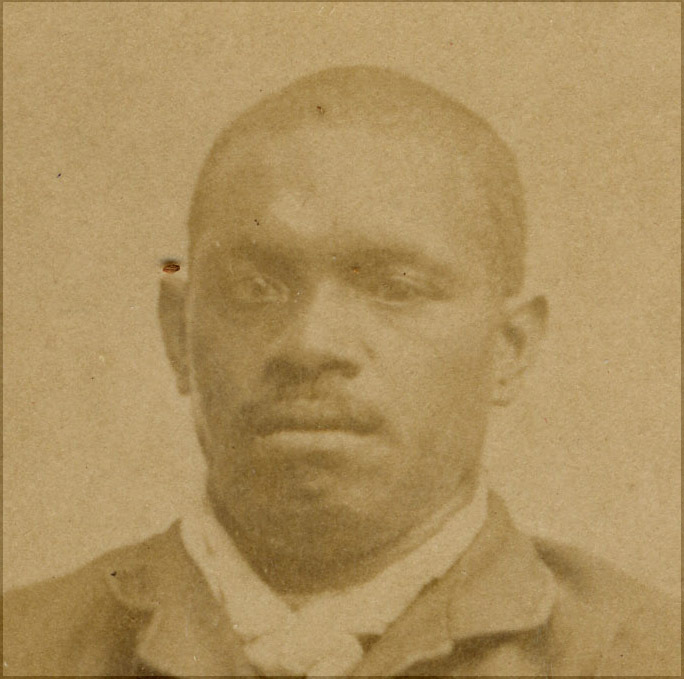 The studio photograph represents a male Polynesian, approximately 24 or 25 years old, sitting in a chair before a painted backdrop. His feet are exposed and his hands are relaxed on his thighs. In his report, Dr. Bowe expressed bewilderment over the autoamputation in the fingers and toes of his patient and he circulated copies of the photograph among his colleagues. Dr. Joseph Bancroft (1836-1894), who was honorary resident surgeon to Brisbane Hospital at the time, saw the photograph and was perfectly convinced it was a case of leprosy (L. nervorum). He also believed that Dr. Bowe's inability to recognize the disease was an example of a deficiency in the training and literature available to English medical students (Australasian medical gazette, vol. 11, p. 427). Bancroft was one of the first pioneer practitioners to encounter leprosy in Australia, writing it up as "Islander's Toe Disease" in an unpublished case report dated 1855. It seems hardly possible that Bowe had no knowledge of leprosy in Australia's Chinese population, but was he confused by the absence of anaesthesia and skin plaques in his patient? A variety of other diseases, such as syphilis, syringomyelia, purpura fulminans, arthritis mutilans, primary acroosteolysis (Hajdu-Cheney syndrome) can all present solely as phalangeal bone resorption or distal necrosis. Acromegaly and hyperthyroidism can also lead to acroosteolysis and here a closeup of the patient's face can be examined for these features—vide intra: »». However, Bancroft was probably right, both about the diagnosis and about Bowe's abilities.